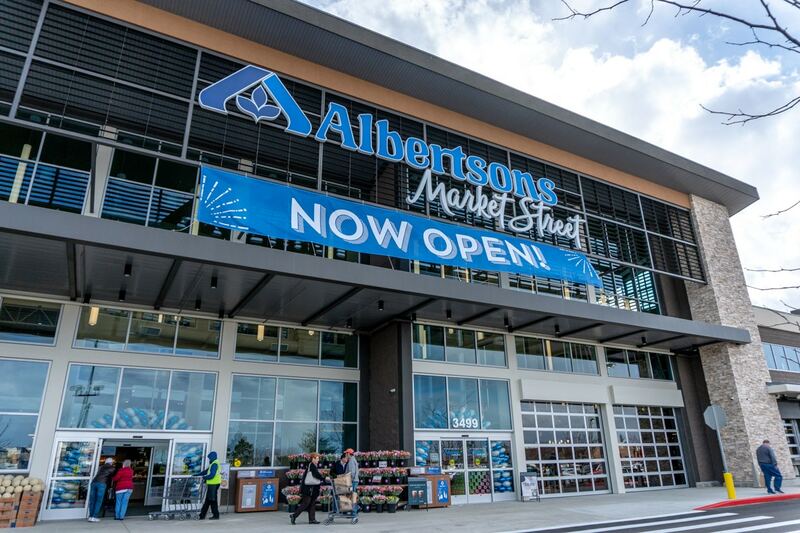 On March 8th, Albertsons opened its Market Street store in Meridian, Idaho. It is Albertsons’ largest store to date at 110,000 square-feet. If the size wasn’t enough, the design of the exterior stands out among its neighbors with large windows, light brick, and dark metal accents giving it a more modern feel. Upon entering, it is clear to see that it will take some time to tour. This is not the typical grocery store of the past. Imagine a COSTCO sized warehouse designed with the luxury and modernity of a high-end store. Every detail, department, fixture is done to the nines, leaving a shopping experience where customers will want for nothing. The store features a floral department that stretches across the entire storefront. The impressive display of orchids, roses, and various tropical/specialty flowers and plants are beautifully arranged in front of the check stands. Nearing the pharmacy, there is a floral booth where you can watch the florists make arraignments or ask to have one specially made. In the left corner of the store, the pharmacy is on full display, with a large open counter and well-lit displays in front with their slogan “Live Healthy. Be You.” Tucked away right next to the pharmacy, is an Akos Med Clinic. Using FDA approved medical devices, patients are guided via augmented reality (AR) to collect vitals and a complete patient work-up is sent electronically to an Akos healthcare provider with a breakdown of predicted illnesses and treatment options. The idea is to provide basic non-emergent health care quickly and at reasonable rates. 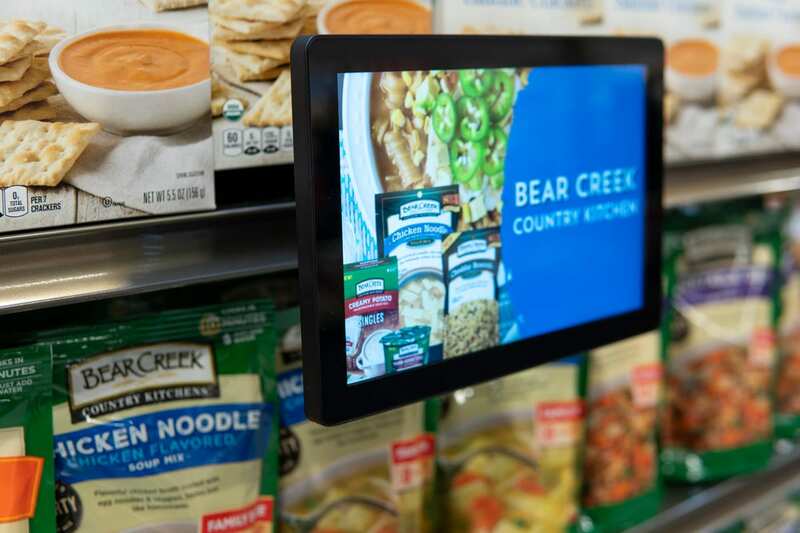 In every department throughout the store there are screens on the aisle ends, playing eye-catching video of the items on display. In the frozen department, video is displayed on the freezer doors themselves, giving the department a cool, futuristic look. The screens are not only great for grabbing your attention, they also have the capability to tell more about a product’s story. The importance of this cannot be overstated. Today’s consumers are paying attention to a brand’s ethics and ingredients more than ever before. Building the right brand image is pertinent to future success. The digital signage innovation also creates efficiency. Advertising and pricing can be changed in a matter of seconds, eliminating the antiquated need for printed signage, and stress of mis-marked tags! Across from frozen, a global flavors section is decorated with multi-colored flags representing the different countries of origin. Polish, German, Irish, Basque, and Mediterranean are just a few of the sections that can be found here. It may be one of the largest Ethnic sets we have seen. The selection was incredible, and comparable to a specialty store. The amazing innovation doesn’t end in grocery or center store, as fresh also takes the cake (pardon the pun). 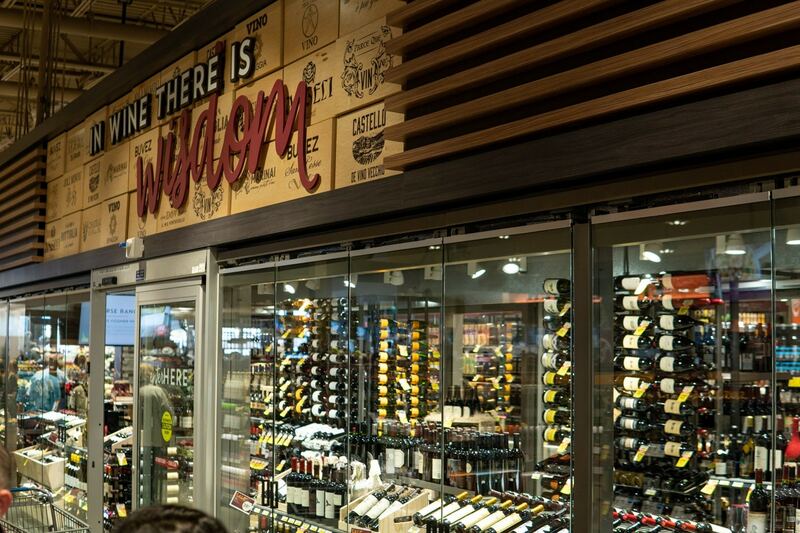 The meat department has an impressive dry-aged meat display, lobster tank, and a seafood bar. In the display case, the butcher counter offers a wide array of meats. Over in the bakery, there is a display of delicately decorated cakes and sweets that could rival a gourmet bakery. Aside from the pastries and cakes offered, there is an assortment of freshly baked artisan bread. Produce is sectioned off by brick pillars with wooden beams and is titled “The Garden”. If you look up, you can see different lighting for the area, which brings to life all the vibrant colors of the medley of fruits and vegetables. Albertsons seems to understand the importance of healthy convenience for today’s busy consumer and offers a large selection of pre-cut fruits and vegetables (available by the container or by the pound). Following the wall along the produce section, you have your pick of ready to eat foods. Soups, salads, burgers, pizza, stir fry, sushi, or poké—whatever you’re craving, they probably have it. You can stop by Starbucks for a drink or make your way to the full-service bar, Talon Tap & Spirits. There is a lively ambiance here with some people enjoying a drink at the bar, listening to the live music. Others watch TV on one of the multiple screens above the tables and booths while they enjoy a meal with their family. When ordering, the menu has something for everyone, including those with dietary restrictions. If you enjoy wine, you can order a glass from the bar or wander into the fully stocked wine cellar. They offer over 3000 types of wine and if you have trouble choosing, there is a sommelier on hand to assist. If you prefer beer, there is also a large selection available nearby or at the bar. 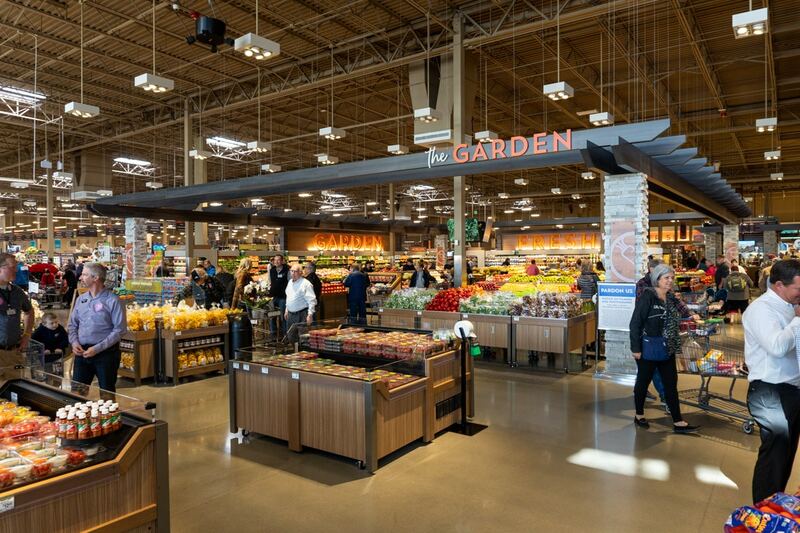 Albertsons has differentiated itself as more than a just a grocery store and has created a destination. Apart from all the available items in the store, there are also several activities to choose from. Currently, you can take a charcuterie class, learn how to care for orchids, book a consultation with a concierge for events, make cheese, or listen to live entertainment in the bar. If your goal is to eat healthier, they have a licensed on-site wellness dietician to help. With so many things to choose from, in such a welcome environment, it’s easy to come in and stay awhile.